He’s Telling The Weather Forecast, But Gets An Unexpected Surprise…And It’ll Warm Your Heart! In a tv station in Germany, the weather forecaster begins by going over the week’s weather just like another regular broadcast. For some reason, a surprise visitor joins him on screen! 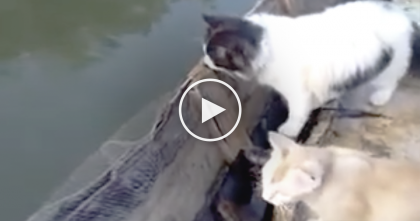 An adorable cat rubs around the man’s legs, just showing a bit of love. So what does the weatherman decide to do? Pick up the cat and keep on broadcasting! It’s clear the man loves kitties and does a great job finishing up the report, as well as keeping his fluffy friend snuggled up in his arms. 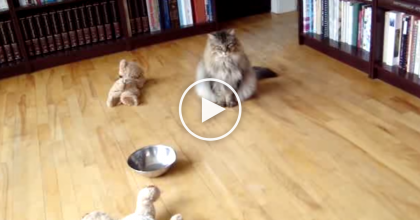 This is too cute – you’ve got to see this! What a sweet surprise–SHARE this cute video with a friend! 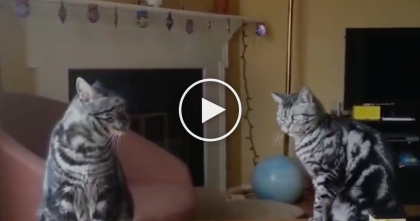 Cats Know How To Clean Stuff Up… Now Watch How They Do It, This Is Just HILARIOUS. 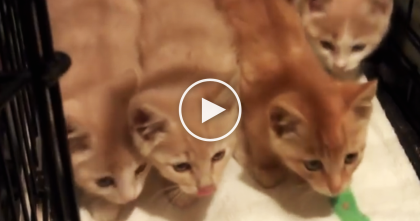 Feral Kittens Are Rescued After Something Horrible Happened To Mom, But Watch Them Now… Very Touching! He’s Walking Through The Jungle At Night, When All Of A Sudden…This Is HARD To Believe? !